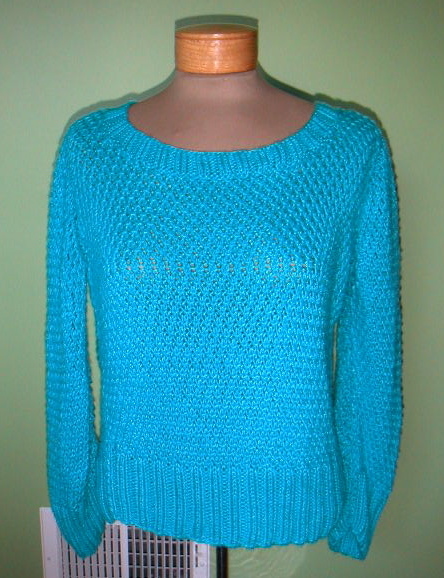 I finished seaming up the sweater last night. I'm not sure if I like this sweater at all. You can sort of see how it still leans to the left side. And the seams are all weird and tight because of that too. I was hoping that if I threw the sweater in the washer and dryer, some of the problems might be corrected, but it doesn't look like it. I've used the KnitPicks Shine before, but with this project I had a horrible problem with it leaving a thin coating of fuzz on myself whenever I'd knit for extended periods of time. I then made the mistake of washing it with other clothes and there were tons of yarn pills on everything! This may be a wear-around-the-house sweater only.